Australia is fortunate to have a diverse natural environment and a vibrant healthy community with good access to healthcare. However, air pollution, drought, extreme weather and bushfires threaten our health and livelihood. At the 2019 Federal election we call for bold measures to protect and promote health. Read more here. 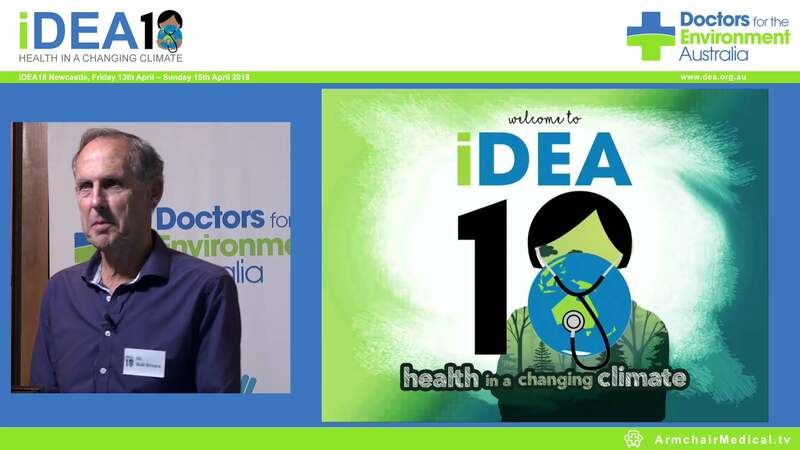 Doctors for the Environment Australia (DEA) commends the AMA for listing ‘Climate change and health’ as one of their Key Health Issues for the 2019 Federal Election. Doctors for the Environment Australia is pleased to be a signatory to an open letter from many of Australia’s leading organisations, which call for all candidates in the upcoming federal election to address with speed and urgency the detrimental effects of climate change on public health. NSW is fortunate to have a diverse natural environment and a vibrant healthy community with good access to healthcare. However, air pollution, drought, extreme weather and bushfires threaten our health and livelihood. At the 2019 NSW election, we need to consider measures which protect and promote health and wellbeing. Read DEA's prescription for a Healthy New South Wales. A much welcome meeting took place this week between AMA President Dr Tony Bartone, DEA's Co-Chairs Prof Kingsley Faulkner and Dr Eugenie Kayak and Dr Laura Beaton. The lengthy and productive meeting focused on the impact of climate change on health, sustainability in health care, and the forthcoming federal election. They also discussed the urgent need to act on emissions reduction. DEA has provided a submission in support of stopping all coal mining in the Galilee Basin. Drs Lucy-Jane Watt, Karin Kochmann and Andrew Jerimijenko were asked to appear before the committee and gave evidence about health impacts of climate change and coal mining. The evidence was well-received and the committee has asked for further details about the dollar-health costs of climate change. However, DEA's delegation said it was disheartening to see some members keep returning to 'rusted-on ideology', suggesting 'Adani coal is cleaner and somehow better for climate change, and preoccupied with our coal saving the developing world'. Doctors have today pledged strong support for children planning to walk out of school on 15 March to demand action on climate change, and are urging Australia’s thousands of doctors to do the same. The Murray issue is just one of several complex issues that governments can no longer manage for the future, simply because human nature being as it is, electoral needs and demands will always hold sway. Management of the Great Barrier Reef and climate change policy fit into the same category — they must be taken out of the political sphere. A little brown rodent is the first mammalian extinction attributable to climate change. In the wake the demise of the Bramble Cay melomy, DEA's biodiversity committee convenor, Dimity Williams, says Australia needs to act quickly, as both extensive habitat loss and climate change are major factors in further extinctions. For example, there is near complete loss of old growth forests in Victoria. "Areas they have left are very small and they are vulnerable to severe weather events." She said that while many people would question why the extinction of the Bramble Cay melomy should matter to any one individual, the answer lies in humankind's reliance on all natural systems for health. From ecosystems that clean water, air and provide food, to the medicines and anti-venom that come from plants and animals, human rely on all sorts of ecosystems to continue functioning.